Happy 2019! If you’re welcoming the new year with the resolve to shake off unhealthy habits and the residue of holiday indulgences, you’re not alone. With fresh energy, many people set their sights on a detox program to kick off a healthy new year. That said, following a strict detox program may not be necessary to get these benefits. Establishing simple habits that create a cleaner lifestyle may be more effective in the long run and are generally less daunting than a strict cleansing regimen. Unfortunately, toxins are a reality in today’s world, and are pretty much unavoidable. But when we make conscious lifestyle choices to lessen our toxic load and support the body’s natural channels of elimination, it can make a significant difference in our health. Here are 5 ways to shift your lifestyle to support natural detoxification - every day. It’s time to KonMari your diet. If you’re looking to clean up your act and your body, then there are a few things you should be limiting (or even avoiding completely) that are not “sparking joy” for your body’s health. Reduce, as much as possible, your intake of alcohol, sugary drinks, candy, and processed foods which tend to be higher in sugars, salt, trans fats and lower in fibre, healthy fats and nutrients. Not only do these foods offer little nutritionally, but they can also burden the body with inflammation. Before you do, you may consider consulting with a dietitian, naturopath or registered holistic nutritionist who can work with you to customize a nutritional plan based on your personal health goals and constitution. What goes on your body affects you too – often, what goes on your body goes in your body. Clean up your personal care routine by opting for natural products to care for skin and hair. Some herbs that can help your body eliminate toxins include milk thistle, dandelion root, and burdock, which all have benefits in supporting the body in gentle elimination. Visit your local CHFA Member health food store to see what detox-supportive products they carry. Fasting isn’t the ideal way to detox for everyone, especially in the colder winter months. Eating can still support healthy detoxification, so long as you think clean eating. WHOLE foods provide nourishment and promote healthy digestion – both of which are integral to a healthy clean body. Fresh fruits, vegetables, nuts, seeds, pasture-raised meat and eggs, and wild fish all provide potent nourishment for your body without harmful additives. Consider choosing organic food whenever it is available and affordable for you – this can help minimize your exposure to herbicide and pesticide residues, along with some other great reasons. 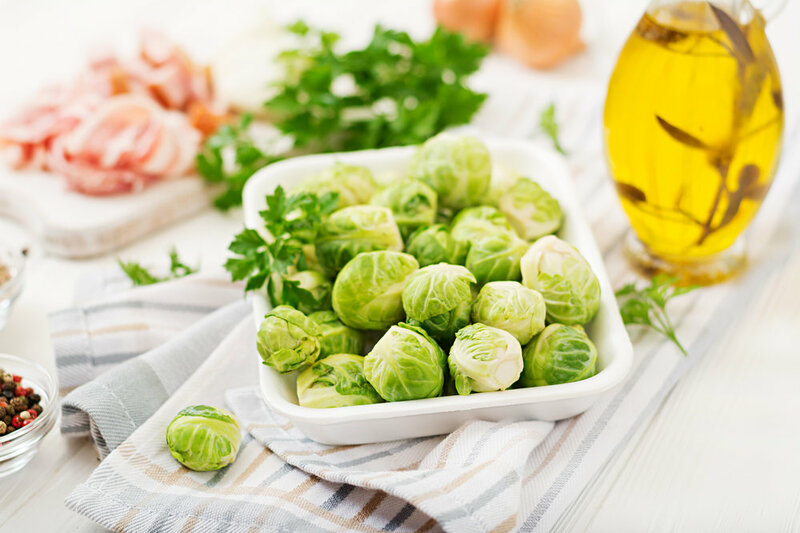 Up your intake of brassica family veggies: kale, brussels sprouts, cauliflower, broccoli, and cabbage all contain compounds (i.e. sulforaphane) that support both phases (I & II) of liver detoxification. They are also excellent sources of fibre, which can help with healthy bowel movements and elimination. Some simple daily habits can act as healthy housekeeping for keeping the body “tidy”. Kicking off your day with a glass of room temperature water with fresh lemon squeezed in it is a popular routine adopted by many to hydrate, alkalize and prepare the body for digestion. Hydration supports the kidneys, skin (basically the whole body) and is key to overall health and detoxification. Fill a large bottle with water and keep it with you, as a reminder to drink enough each day. Take a probiotic to promote digestive health so that your microbiome can help you absorb the nourishment you need, and eliminate what you don’t. Fermented foods and other digestive supportive habits can also aid in natural detoxing. Get in the habit of body brushing, which promotes healthy circulation, stimulates the lymphatic system and provides rejuvenating skin exfoliation to our skin – the largest organ of waste elimination! Choose a natural-fibre brush, made from coconut husks or the agave plant, and try a cold-water blast at the end of a hot shower for extra lymphatic drainage and invigoration! We’re all aware of the power of regular exercise, but in terms of aiding detox, it gets you and your organs of elimination activated. Quickened breath, movement, stretching and sweating all help clear out residue - plus it feels so good! Walking, yoga, dancing, swimming – whatever gets you moving and your heart pumping – is a step (or downward dog) in a healthy direction. If your local gym or spa has a sauna, this can offer a bonus boost to elimination –especially infrared saunas – and can also be a soothing mid-winter indulgence. And sweating it out is great way for our bodies to release toxins! Shifting dietary habits, even to healthier ones, means the body must adapt, which isn’t always comfortable. Headache, nausea and fatigue are all common side effects of detoxing and can even occur during a mild detox. Consider beginning any shift of habit during a period of a few days where you are able to get extra rest and be sure to drink plenty of water. Be kind to yourself – stress reduction and clearing out negative emotions is a form of detox too! Diet, habits, movement and self-care all support your body’s natural abilities to cleanse itself of an overly toxic load and promote its natural elimination capabilities. You don’t have to do it all, as each of these approaches towards lessening your toxic load comes with healthy benefits. Still hooked on the idea of a program to kick start things? Your best bet is to talk to your health practitioner for safe and effective recommendations that suit your personal constitution and lifestyle. What works for someone else may not be the best fit for you. You can also discuss detox-supportive products with the knowledgeable staff at your local CHFA member health food store. Cheers to a happy, healthy, and less toxic 2019!